^ Brown v. Topeka Board of Education（布朗诉托皮卡教育局案） ,  (U.S. 1954). ^ Rains, Craig. Little Rock Central High 40th Anniversary. （原始内容存档于2006-12-17）. .
^ Boyd, Herb. 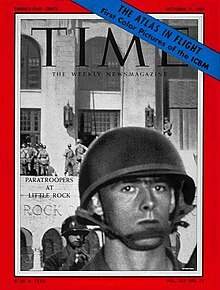 Little Rock Nine paved the way. New York Amsterdam News 98 (40). September 27, 2007 [March 4, 2009]. ^ Retreat from Newport. Time. September 23, 1957. .
^ Smith, Jean Edward. Eisenhower in War and Peace. Random House. 2012: 723. ISBN 978-0-679-64429-3.